10 oz Britannia Silver Bar | ?? 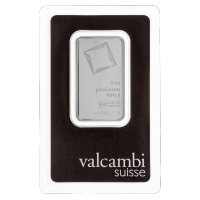 We'll offer you the lowest price on all the web, when you order your 10 oz Royal Mint Britannia silver bar from our online shop today. These striking silver bars from the Royal Mint feature a refreshingly modern take on the the beloved Britannia figure, who symbolizes British strength, liberty and unity. The bar's obverse features a poised Britannia with her war helmet, fish scale armour and trident, rendered in such sure and meticulous detail as to give this Britannia a truly modern flare. Britannia's imposing figure is set against a field of stylised wave design, owing to her maritime connections; she is joined only by the 'Britannia' title in the lower left corner. 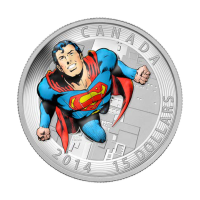 The reverse features the same, intricate and striking field of wave design and includes the pictorial and written Royal Mint logos, as well as details of weight, metal content and purity. 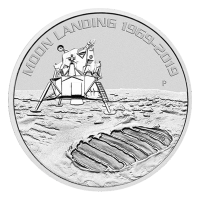 Interest has been added at the bottom of the reverse, where a region has been kept clear of the field texturing in an artful wave shaped design. 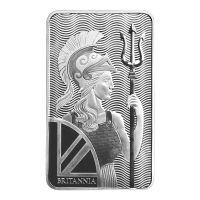 Although the history of the Britannia figure spans more than 2000 years, this is the first Britannia themed bar to be released by the Royal Mint. Celebrate the enduring strength, unity and liberty of Britain and fortify your holdings with a 10 oz Royal Mint Britannia silver bar now! 正面 Britannia standing in defense with trident and shield over top a wave background. 反面 The Royal Mint logo followed by the bars weight and purity over top a wave background. Britannia standing in defense with trident and shield over top a wave background. 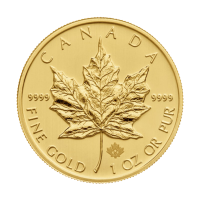 The Royal Mint logo followed by the bars weight and purity over top a wave background. 10 oz Britannia Silver Bar We'll offer you the lowest price on all the web, when you order your 10 oz Royal Mint Britannia silver bar from our online shop today. 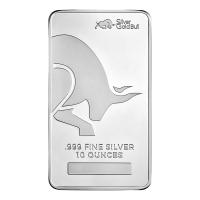 These striking silver bars from the Royal Mint feature a refreshingly modern take on the the beloved Britannia figure, who symbolizes British strength, liberty and unity. The bar's obverse features a poised Britannia with her war helmet, fish scale armour and trident, rendered in such sure and meticulous detail as to give this Britannia a truly modern flare. Britannia's imposing figure is set against a field of stylised wave design, owing to her maritime connections; she is joined only by the 'Britannia' title in the lower left corner. 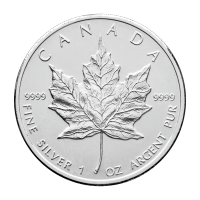 The reverse features the same, intricate and striking field of wave design and includes the pictorial and written Royal Mint logos, as well as details of weight, metal content and purity. Interest has been added at the bottom of the reverse, where a region has been kept clear of the field texturing in an artful wave shaped design. Although the history of the Britannia figure spans more than 2000 years, this is the first Britannia themed bar to be released by the Royal Mint. Celebrate the enduring strength, unity and liberty of Britain and fortify your holdings with a 10 oz Royal Mint Britannia silver bar now!